UK Self Store Limited is based on the corner of Dennis Road and Tan House Lane in Widnes, Cheshire. For a period of sixteen weeks from mid-July, roadworks will be underway on nearby Earle Road, affecting access to our storage facilities. We remain open as normal – all storage facilities and our Packaging Shop (for boxes and packaging materials) is still available – ideal if you need to pick up some items on the way to/from The Hive Entertainment Complex. If you’ve not seen our facilities before, why not use the diversion as an excuse to pop in and see if we could help you with your storage needs? Earle Road connects the A557 Ashley Way/Watkinson Way with Dennis Road. 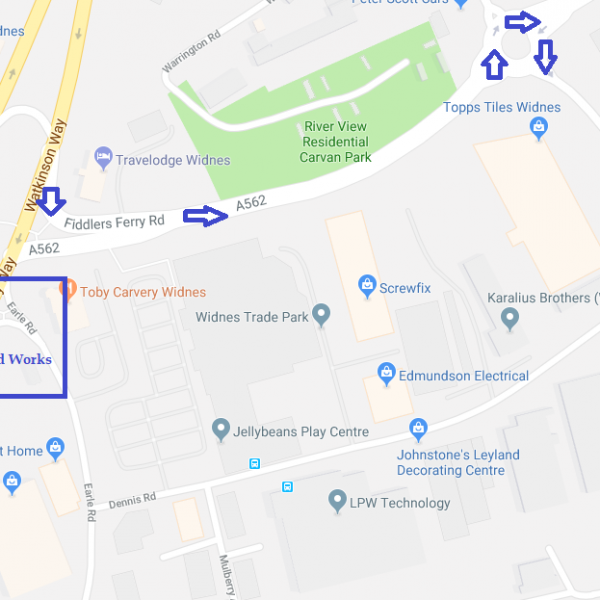 Works are now underway to increase the number of lanes on Earle Road, and until this work is complete, the only access to Dennis Road and UK Self Store will be via the A562 Fiddlers Ferry Road. Fiddlers Ferry Road is the main road that runs in between Travelodge and the old B&Q site in the Centre of Widnes. Upon entering the gyratory, remain in the left-hand lane to exit onto Fiddlers Ferry Road. Drive past the Travelodge to the first roundabout and take the third exit onto Tan House Lane. After the Car Wash on the right-hand side, take the first right into Dennis Road, and UK Self Store will be the first building on the left – just look for all the caravans parked outside! 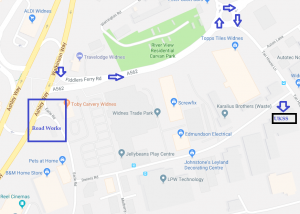 Take the A562 through Cuerdley and Penketh towards Widnes. At the Eight Towers roundabout, take the second exit onto Fiddlers Ferry Road. Continue to the next roundabout (Topps Tiles) and take the first exit (left) onto Tan House Lane. After the Car Wash on the right-hand side, take the first right into Dennis Road, and UK Self Store will be the first building on the left – just look for all the caravans parked outside!